Tiny teapots are easier to pack. 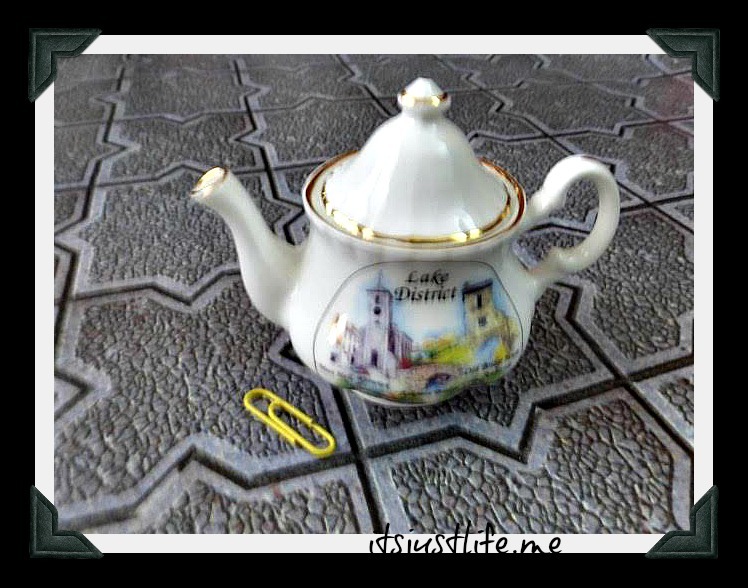 Tiny teapots are easier for loved ones to bring home from travels as gifts which explains the teapot on the blog today. My mom took a trip to England and this was one of the little things that found its way back to the US with her with its destination being my home. I love this tiny little teapot that highlights the historic Lake District. The Lake District is also known as The Lakes or Lakeland. It is a mountainous region in North West England. As a popular holiday destination, it is most famous for its lakes, forests and mountains (or fells) and its associations with the early 19th-century writings of William Wordsworth. 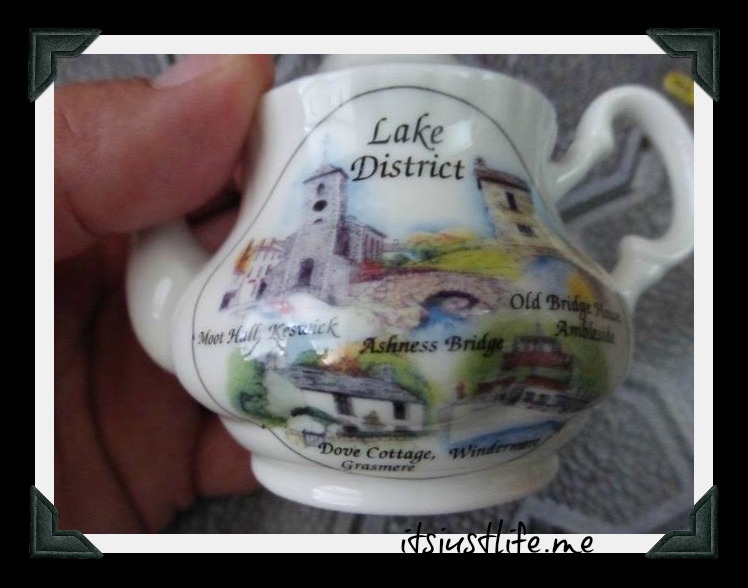 The pictures on the front of this tiny teapot depict several places in the area that are must sees including Ashness Bridge, Dove Cottage, Moot Hall, Keswick, and Windermere. So if you travel and see a tiny teapot think of me, will you? They are easy to fit into a nook and cranny in your suitcase. Just saying. 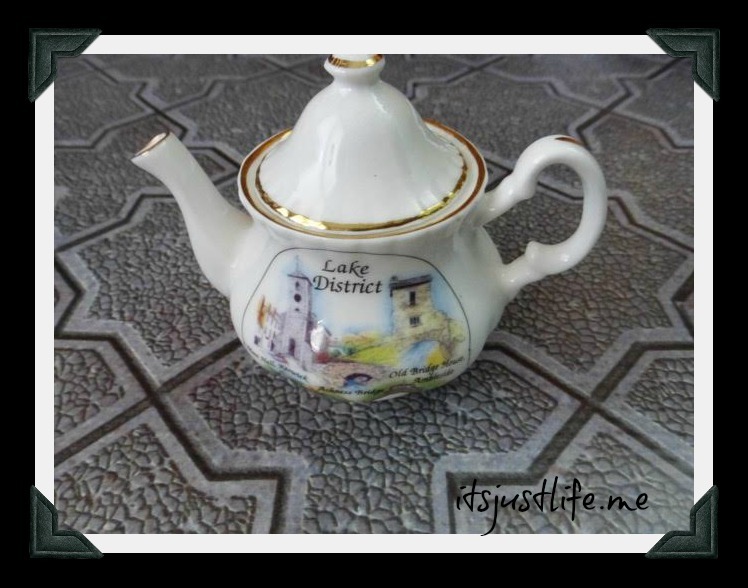 On my birthday this year my good friend and North Iowa Blogger, Donna, coordinated a mass effort to flood my Facebook wall with Teapot Songs on my birthday.. It was perfect and I am going to share them with you occasionally. Today’s was done by a kindergarten class who is taught by none other than Betsy who blogs at Our Little Kirby World. I think you will love it every bit as much as I did on my birthday. I’m A Little Teapot from Beth Ann Chiles on Vimeo. 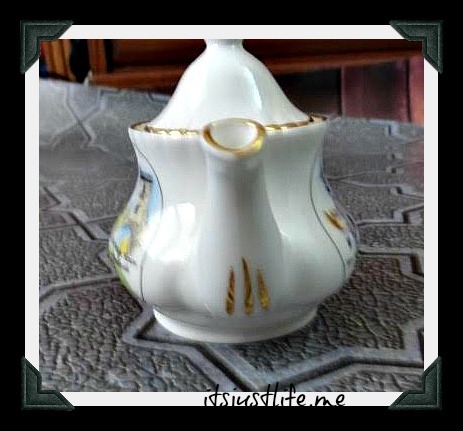 Did not find teapot at last thrift store outing but found small ceramic small watering pail white , gold leaf trim. What a sweet little teapot. And what a sweet thing Donna did for you. so delicate and sweet. just look at the detail even though it’s small — beautiful. Very cute. Both the teapot and the kiddo’s! Thanks! The birthday surprise was the best of all. Thank you!